In an appearance worthy of Houdini, a Chicago man replacing roof insulation in his home realized that the insulation material was in fact scores of old posters for a Harry Houdini magic show. Master of illusion and escape artist, celebrated worldwide, Harry Houdini captivated crowds with his death-defying stunts and unique brand of magic which seemed to defy the very laws of nature. Could such rare and random theater signs possibly be real? With the theater where the alleged performance took place no longer in business, our contributor is eager to determine the poster’s authenticity as well as learn what kind of show Houdini was performing in Chicago. 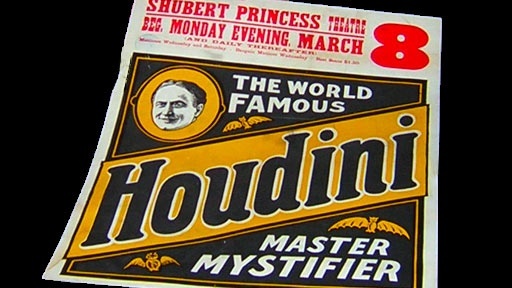 Houdini built his reputation on elaborate tricks and illusions, yet in later years, he devoted portions of his stage acts to questioning the spiritualists and clairvoyants who claimed they could contact the dead. History Detectives ventures to New York City and Las Vegas to peer behind the magician’s veil, and examine the final chapter in Houdini’s career. Related Investigation Hollywood Sign Is this a piece of the original Hollywood sign? Also in Emerging Modern America: 1890-1930 Jim Thorpe Ticket Is this ticket evidence of a chapter of Thorpe's career forgotten by history: as a professional basketball player? Also in Emerging Modern America: 1890-1930 Bonus Army Stamp Is this stamp connected to a moment when the U.S. Army fought fellow soldiers in the nation’s capital? Also with Gwen Wright Unwed Mother's Home Is this small medallion enough information to help a woman find her birth parents?